OPAD is a 100% designed by default blogger template (Soon to be published BlogSpot theme). Everything about the theme from its layout to its coding is by default and therefore it suit the blogging nature of every random blogger. With OPAD you can decide whatever you want, including either showing the full post on Homepage or showing half post. Other templates feature an automatic read more plugin that lets you automatically shorten the post length on the homepage while showing the full post on post page but with OPAD you do everything yourself which is what I love most about it. You can decide the length of the post and to which a number of words you want to show. It’s all your choice and with this little default setting by Blogspot, you can do it awesomely in no time. May other templates are like this, especially the default templates created by blogger and should in case you are having any problem showing only half post in the homepage, you can either add the automatic format which you can add on this post (Blogger Auto Read More With Thumbnail) or you follow the below procedures. After composing your post, simply implement the following procedure to show half post but if you want full post, don#t border with this. Locate the “Jump Break” option at the top, where you have ‘add link’, add image and others. It is seen right after the option for Emoticons. Clink on it and you should then see a thick line crossing. That’s all. You can now publish your post. 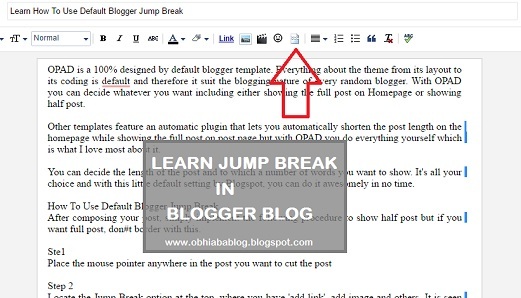 This post is to advertise my soon to be published blogger template OPAD and also to show users how to enable the blogger default Jump break option in Blogspot. Hope it worked well for you.